Holipoda and Mendhapodi are two unique rituals that are associated with the Holi festival in Orissa. Holi festival in Orissa is more popularly known as Dola Purnima and starts on the Fagu Dasami day in the month of Phalguna (February – March). Holipoda and Mendhapodi are observed on the fourteenth day of the waxing phase of the moon in Phalgun month. 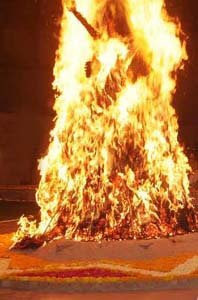 ‘Holi Poda’ celebrates the burning of demon Holika. Mendhapodi celebrates the victory of Lord Krishna over Mesha. In Holipoda, a straw hut is set on fire symbolizing the victory of good over evil. Legend has it that Holika or Holi, the sister of demon King Hiranyakashipu, had got a boon that from Lord Shiva that she will not die by burning of drowning. Hiranyakashipu wanted all the people to worship him and he had failed in his attempts to kill his son, Prahlad, who was a devotee of Vishnu and only worshipped Vishnu and not Hiranya. 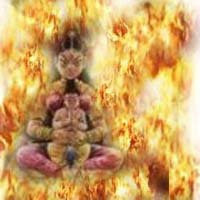 Hiranyakashipu, who was aware of the power possessed by Holika, asked her to enter blazing fire with Prahlad. But with the grace of Vishnu, Holika was killed and Prahlad escaped unscathed. Hiranyakashipu wanted to know from Lord Shiva why his boon did not work. Shiva reminded that he gave Holika the boon to protect herself and not to use it to kill innocent people. Holipoda is celebrated in memory of this event and on the next day people celebrate the victory of the good over evil by throwing colors. Another legend has it that a demon named Mesha was creating mayhem around the world. He defeated humans and demi-gods and carried out numerous atrocities. Finally, Lord Krishna killed him in a battle and his body was burnt to ashes. Just as in Holipoda, people create straw huts and burn it down and play Holi with colors on the next day.